KUCHING: Kuching Sentral Regional Bus Terminal (Kuching Sentral), a project spearheaded by Permodalan ASSAR Sdn Bhd (PASB), has been deemed a success, attracting visits from several Federal Government agencies as well as bus terminal operators from West Malaysia keen to learn from their system and management. This privately funded project which cost RM90 million was completed in March 2012 with the full relocation of the bus terminal operation in 4th mile to the new Kuching Sentral taking place in May 2012. According to PASB’s chairman of the board of directors Tan Sri Datuk Amar Bujang Mohd Nor, they are always on the lookout for ideas and concepts which suits well with the current trends and development phase in Sarawak. 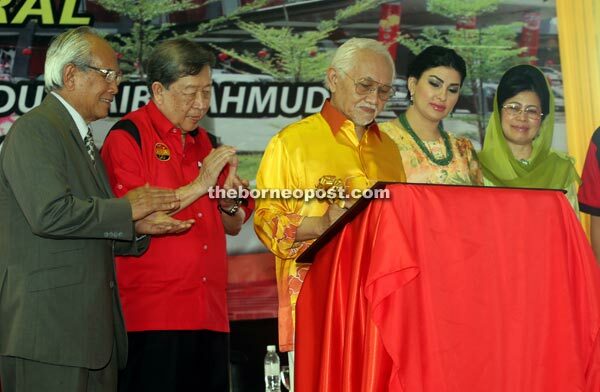 “That was when the idea and concept to develop a modern and integrated one-stop centre which combines a public land transport facility with the shopping centre, which is considered a new concept here in Sarawak,” he said during the official opening ceremony of Kuching Sentral yesterday. He went on to say that the current location was chosen for its suitability which is at the outskirts of Kuching, noting that it is a very strategic in holding an influx of long distance express buses into the city. “Therefore, we also help in easing the traffic congestion in the city,” he added. With the development of Kuching Sentral, it has benefitted not only the locals but more importantly, those commmunities from outside Kuching who are relying on the bus transport system as their means of transportation. In addition, they can now shop with ease and comfort while in the terminal. Bujang Nor went on to highlight that Kuching Sentral has always been the catalyst to other development and the rising economic activities in the surrounding areas, resulting in the opening of new businesses and creation of job opportunities, later contributing to the upliftment of the social economic standing to the local communities. In terms of its ticketing system, he pointed out that Kuching Sentral is the only public terminal in Sarawak which employs a computerised ticketing system whereby the issuance of boarding passes and collection of payments for all bus companies which are operating in the terminal. He added that all bus companies operating in Kuching Sentral are being managed by the terminal management company. “Since the introduction of this system, we were informed that the bus companies had been able to double their sales and revenue collection,” he said. In its press statement, PASB noted that throughout 2013, the total recorded passengers in Kuching Sentral numbered at 272,255 compared to 190,335 passengers as at the third quarter of 2012. The highest recorded number of passengers recorded is usually during festive seasons such as Christmas, Gawai, Hari Raya Aidil Fitri and the Chinese New Year. With 14 express bus companies currently operating in Kuching Sentral including two from Indonesia, there are an average of 80 bus trips from the terminal daily. This figure can go up to 100 trips per day during festive seasons. Overall, Kuching Sentral differentiates itself from other terminals with its modern facilities such as fully airconditioned, wide and spacious waiting areas, equipped with modern computerised electronic displays of bus departure scheduls as well as a public announcement system that can be heard throughout the building. In addition, Kuching Sentral also provides a wide range of public facilities like bag and cargoes storage areas, surau, food and retail outlets, clean and spacious public toilets, and a modern security system.